Logitech’s peripherals serve a wide range of consumer electronics, although in recent years, the company has increasingly seemed to target products bearing Apple’s unmistakable logo. 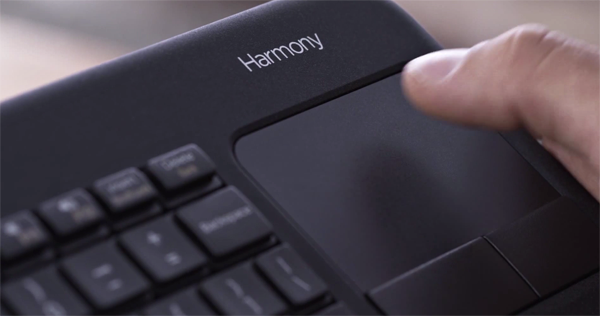 Its Harmony series has sought to reinvent the way we interact with our digital devices at home, and the feature-packed new Harmony Smart Keyboard follows this same ethos by providing a novel way of controlling the likes of the Apple TV set-top, as well as pretty much anything else one could possibly own in the world of living room gadgetry. 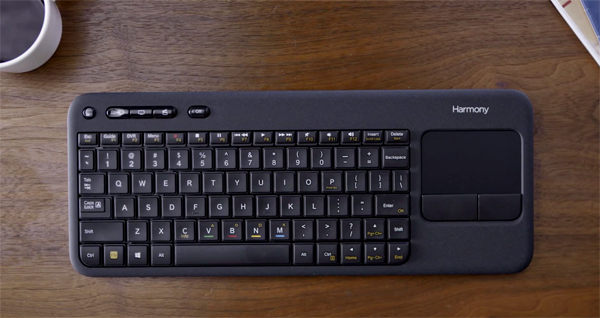 The keyboard, broadly speaking, takes many different forms, but the Harmony Smart Keyboard is quite unlike anything we’ve ever stumbled across. This little powerhouse supports almost one quarter of a million different home entertainment devices spanning several thousand manufacturers, and with all of the necessary connectivity ranging from Wi-Fi to infrared, this smart keyboard essentially does it all. It’s like a remote control tuned up a few million notches, with every single feature one could ever require in one surprisingly compact package. From the simple stuff like changing channels and controlling media to surfing the Web and typing emails, the Harmony Smart Keyboard from Logitech is a dream machine for lazy folks and geeks in equal measure. Out of the box, you get the Harmony an IR blaster, a couple of USB micro receivers and a USB extender. 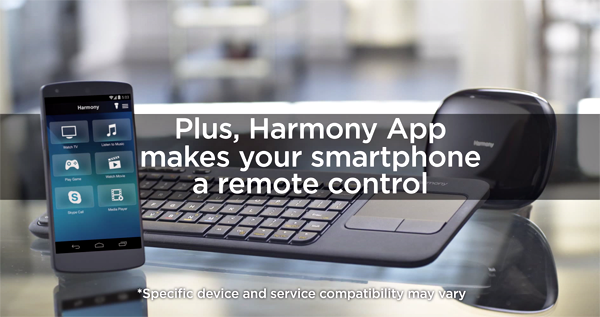 You also get a Wi-Fi hub receiver, which is useful for turning your mobile device into a living-room ready remote control, and if you’ve caught coverage of some of the older members of the Harmony family, you’ll be more than aware of what this entails. At a cost of $149.99, all that functionality doesn’t come cheap, but as a license to do away with the annoyance of having several remotes lying around, ready to be lost, the Logitech Harmony Smart Keyboard looks a very agreeable one-stop solution. Even in this day and age, with technology being as advanced as it is, most of us find ourselves playing hide and seek with clunky remote controls, and when we do find them – under the cushion, as ever – they tend to need new batteries. The Harmony puts a stop to this tiresome, tedious rigmarole, and if the video below takes your fancy, be sure to check it out.